As you enjoy your long weekend, consider spending some time with the folks who brought you the five day work week. The Delaware State AFL-CIO is holding its Labor Day parade on Monday, September 3 in Wilmington. The parade starts at 10:00 a.m. at 12th & King Streets, and proceeds down to Tubman-Garrett Park on the riverfront (behind the Amtrak station), the site of a rally from 12 noon to 3:00 p.m.
For those who think that labor unions (or parades for that matter) are anachronistic, I would point out that we live in an era when wealth is being concentrated on a scale not seen in a century. I don't think it's too much to ask that working folks be given the opportunity to organize on their own behalf. Besides, it might even be fun. Tell 'em TommyWonk sent you. I've been invited to join a panel discussion on blogging and public issues today at noon on the program Delmarva Today on WSDL (FM 90.7) in Salisbury. I will be joining the program host, Don Rush; Juliet Dee, Associate Professor of Communications at the University of Delaware; Greg Bassett, executive editor of the Daily Times; and G. A. Harrison, publisher of Delmarva Dealings. I think I was asked to join as an example of a polite, well behaved blogger. It should be interesting. UPDATE: I just got off the line after talking for a half hour with the host, Don Rush, Greg Bassett and G. A. Harrison. I'm happy I was invited on; it was a great discussion. Dave at First State Politics posted this he found about how the poor don't have it so rough because they enjoy many modern conveniences like color television and air conditioning. He picked it up from another blogger, who in turn picked it up from Robert Rector at the Heritage Foundation. Dave admonished his readers, "And don’t anyone go all nutsy on me." I'm sure he'll let me know if my response crosses the line into nutsy or not. While it is appropriate to be con­cerned about the difficulties faced by some poor families, it is important to keep these problems in per­spective. Many poor families have intermittent difficulty paying rent or utility bills but remain very well housed by historic or inter­national standards. Even poor families, who are overcrowded by U.S. standards or face temporary food shortages, are still likely to have living con­ditions that are far above the world average. According to the U.S. Census Bureau, the median net worth of the the bottom quintile (20%) of U.S. household income in 2000 was $7,396, the value of a used car. For some, a broken engine block can effectively wipe out a household's net worth. Rector chooses to measure poverty by world standards, and concludes that most Americans have physical comforts unkown in many parts of the world. I choose to measure wealth and poverty in our society in terms of full access to the American dream. Here, I see unfinished work to be done. Health care is increasingly hard to come by for middle income Americans, let alone those working minimum wage jobs. As for higher education, the cost of college is so far out of proportion to the assets of poor families that meaningful comparison is difficult. Even with financial aid, the cost of college can be daunting; the price of an intro biology text can be as high as that color television. The United States is wealthy on an unprecedented scale. Even so, some of us, less sanguine about the lives of the poor, believe that it's not too much to hope that all of our fellow Americans ought to have access to the full benefits of living in midst of this prosperity. Back in June, when the General Assembly was considering statewide recycling, Delaware Solid Waste Authority (DSWA) director Pasquale Canzano admitted that the agency was losing $6 million on recycling, a sum he said the agency couldn't afford. In response to his comment, "We need to do something," I suggested that the DSWA should rethink its business model. DSWA commissioners are likely to consider cost-cutting moves early next month, during a scheduled series of briefings on budget and operating issues. Options could include shifting weekly curbside pickups to every other week. Also under consideration is a switch to "single stream" mixed-good containers at Recycle Delaware drop-off centers, which would eliminate the need to sort and distribute materials among several large bins. "That's certainly an option," said Rich von Stetten, Recycle Delaware manager. "We want to be able to put all kinds of options out there. The more we look into single-stream, the more it looks like it might make sense at the drop-offs." DSWA already plans to eliminate sorting bags and bins from all its curbside recycling programs, allowing all subscribers to put cans, plastic bottles, paper, cardboard and glass in a single container. Patricia H. Todd, a member of the Recycling Public Advisory Council and the League of Women Voters, said she opposes any cuts in services but supports moves that make household recycling easier for residents. "They should go to single-stream, definitely," Todd said. The DSWA's losses should not be taken to mean that recycling can't work. Consider the relative costs of Wilmington’s city-wide program versus the DSWA’s voluntary program. Right now the DWSA's recycling program, which requires residents to sort their material, for $3 a month. The city now collects recyclables from 28,000 households, at a maximum cost to the city of $150,000 (which is not charged to residents) for the coming fiscal year. If the city achieves 50 percent diversion, the net cost drops to zero. The city's maximum cost comes to roughly $6 per household per year, one sixth of the DSWA's cost. We can do more that hope the DSWA understands the need to fundamentally change its recycling program; we can speak out and remind the agency that others are finding cost effective ways to improve recycling and divert waste from landfills. Rodney Square in Wilmington, DE. All Day Music, Food, Community Organizations, and Free Giveaways! 7 am to 7 pm, with the main event from 5 pm to 7 pm. 1021 N. Van Buren Street, Wilmington, DE. For more information about the national campaign to end the surge in Iraq and start bringng the troops home, go to www.noiraqescalation.com. My friend Paul Hughes puts on a show called the Great Green Home Show on Sundays from 11:00 AM to Noon on WILM, 1450 AM. This Sunday, Paul's guest will be Peter Mandelstam, founder and president of Bluewater Wind. With three weeks to go before the PSC deadline for negotiations to bring wind power to Delaware, it will be interesting to hear what Mandelstam can tell us about how the talks are progressing. Is pact with NRG best deal for state? The announcement is here and the letters detailing the consent decree are here. However, it appears the rest of the settlement was driven not by NRG's technical inability to meet Regulation 1146 requirements, but by corporate financial considerations. NRG made no secret of its refusal to comply with Regulation 1146 for Units 1 and 2 (now 50 years old with no pollution controls and no capital expenses). Compliance would require retrofitting the old units at great expense, or shutting them down. Since Units 1 and 2 provide NRG with massive profits, it makes business sense to keep them operating as long as possible. John and Pat have it exactly right. With the capital costs long since paid for, NRG can operate these units as cash cows, throwing off profits without the need for further investment in them. However, the deal to delay reduction of toxic sulfur dioxide, or SO2, and nitrogen oxide, or NOx, comes with a big price tag for Delaware. According to the Office of Management & Budget, each reduction of one ton of SO2 saves approximately $7,300 in health care costs and mortality-based benefits. Reduction in NOx emissions saves $1,300 per ton in mortality-based benefits alone. "Mortality-based benefits" is a term used by economists to quantify the cost of people dying prematurely. The settlement allows NRG to emit 23,000 tons more sulfur dioxide from 2009-2011 than is allowed under Regulation 1146. Based on OMB's calculation for SO2, delaying full compliance with Regulation 1146 will cost $167.9 million in extra health care costs and mortality-based benefits. Instead of reducing NOx emissions below 4238 tons starting in 2009, NRG will be able to emit an additional 5000 tons over three years. The cost of that provision will be at least $6.5 million in health costs and mortality-based benefits. In sum, because compliance with SO2 and NOx regulations has been delayed, the deal will cost at least $174.4 million in additional health costs and mortality-based benefits. How much expense could be offset by the larger reductions in emissions after 2011? The actual reduction in NOx will be from 0.125 lbs./million BTU to 0.100 lbs./million BTU. The reduction in SO2 will be from 0.26 lbs./million BTU to 0.20 lbs./million BTU. In tons per year, these are not large changes. Health-related savings will be about $17.95 million/yr. At that rate, it will take at least 10 years to recover the cost of the deal with NRG. Here we see the cold economic calculus on the part of NRG: The free cash flow generated by operating Units 1 & 2 is accompanied by measurable health costs that don't show up on the company's financial statements. The full cost of this settlement must include the suffering, stress, disease and premature loss of loved ones which will be experienced by many in the coming years. How much did NRG save by settling? We don't know. NRG will continue to pump large amounts of toxic SO2, NOx, carbon monoxide, arsenic, lead compounds, nickel compounds and chromium compounds into the air every day for the next three years. In that respect, little has changed. CCP calls on DNREC to install several gas analyzers and fine particulate, or PM2.5, monitors near the NRG coal plant. We need reliable data on current and future amounts of pollutants at ground level. Currently, the only PM2.5 monitor in Sussex County is at Seaford, well outside the downwind swath of polluted air from the coal plant. Put monitors and gas analyzers in CCP's suspected non-attainment areas of Dagsboro, Millsboro and Lewes. There is no excuse for failing to monitor arsenic, SO2, NOx, carbon monoxide, and fine particulates in locations with high rates of asthma, heart disease and cancer. People have a right to know if substances from the coal plant are making them sick. If the state says it can't afford monitoring equipment, have NRG write a check from their multimillion-dollar revenue stream at Indian River. Make it the price for doing business in Delaware. It seems to me a modest proposal: Ask NRG to at least pay for the equipment that would measure the quality of the air surrounding its plant. The Bush administration has promulgated new regulations to make it easier to destroy the landscape in the pursuit of coal. The new rules would relax restrictions on the horrific practice known as mountaintop removal, in which entire mountains are blasted out of existence and the refuse dumped into what used to be creeks and rivers. WASHINGTON (AP) -- The Bush administration wants to quit requiring coal operators to prove that their surface mining will not damage streams, fish and wildlife. Under proposed new regulations that it will put out Friday for public comment, strip mine operators would have to show only that they intend ''to prevent, to the extent possible using the best technology currently available,'' such damage. This language is nothing short of Orwellian. Mountaintop removal, by definition, does more than damage streams for instance; it causes them to cease to exist. This aerial photo taken near Kayford Mountain, West Virginia shows what mountaintop removal looks like. To give a sense of the scale of the operation, the small object in the right hand side of the photo is a dragline, the largest earth moving machine ever built. The scars inflicted on the landscape are visible from earth orbit. ''With this proposal, we can establish a consistent, nationwide means to reduce the impacts of surface coal mining and provide clear rules specifying what mining activities can and cannot be conducted near bodies of water,'' said C. Stephen Allred, Assistant Secretary of Interior for Land and Minerals Management. Current policy from the Interior Department's Office of Surface Mining says land within 100 feet of a stream cannot be disturbed by mining unless a company can prove it will not affect the water's quality and quantity. 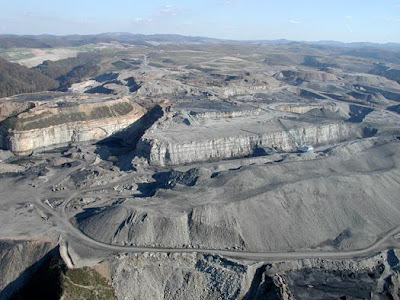 Interior officials have said that complying with that buffer zone requirement is impossible in ''mountaintop removal mining,'' which involves shearing off the tops of ridges to expose a coal seam. Dirt and rock are pushed below, often into stream beds, a practice known as valley fill. In other words the practice cannot meet current regulatory requirements, so the federal government is proposing to make it easier to destroy the landscape on an even larger scale. The Ohio Valley Environmental Coalition has much more on this practice. The proposed rules can be found here. I missed the anti-war rally Monday night at Canaan Baptist Church, but I've been hearing that Dr. Christopher Bullock's sermon rocked the house. I asked him if I could post the text, and he readily agreed. Even though the printed word is no substitute for hearing a preacher like Dr. Bullock, I can almost hear his sonorous tones as I read the prepared text. Our world, indeed our nation, aches with the need for a spirit of hope, peace and truthfulness. Our national condition is extremely serious. We are living in perilous times. We must make sense out of nonsense. We must bring order to disorder. We have pitiful poverty in a land of plenty. The poor are oppressed. The rich are filled with greed. Our priorities must be food to feed the hungry, shelter for the homeless, jobs for the unemployed, a livable wage for the employed, comfort for the aged, affordable housing, quality education for our children, judicial reform, peace among nations and power for the powerless. like their leaders or their particular form of government. I say we need to build bridges – bridges of hope – bridges of diplomacy and bridges of dialogue. This war is costing us $12 billion dollars a month now. We ought to be outraged at the misplaced priorities of the Bush Administration. We must embrace a new moral assignment of peace. America’s economic priorities must shift from wars and rumors of more war to a comprehensive and bold domestic agenda at home. As we sit here tonight, our infrastructure is crumbling. Dilapidated roads, dams and bridges are collapsing. Let’s shift our economic priorities. Our airports, highways and pipelines are beyond problematic. 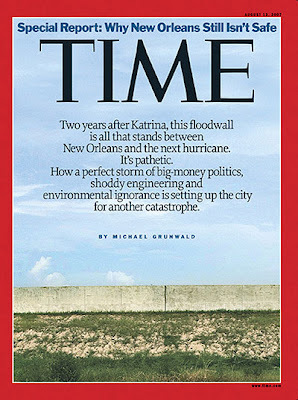 The awful devastation of hurricane Katrina revealed to the world that America’s infrastructure is in desperate need of repair and restoration. Think of what could be done with $12 billion dollars. We could increase security on this soil. We could fix the health care crisis…49 million Americans don’t have health insurance. We could start new economic initiatives in underserved urban markets. The American people deserve better and the world deserves better…and we can do better. avenues. Look at our needs. Look at our common ground. Raise more noble ambitions. Bold vision provides the roadmap for action to change the world. Without a vision, the people perish. I see a new vision of global goodness. One that is based on values, human rights and economic justice. One that uses non-violent means to resolve differences. Talk it out, not fight it out! plenteous, but the laborers are few. So let us not get weary in well doing, for we shall reap if we faint not. Walk together children and don’t get weary. Pray together children and don’t get weary. Sing together children and don’t get weary. Vote together children and don’t get weary. March together children and don’t get weary. Join hand to hand. Heart to heart, and don’t get weary. We shall reap if we faint not. Blessed are the peacemakers. Go in peace ye messengers of peace. This alarming admission was elicited from the electricity minister at a briefing on how the U.S. presence is bringing modern conveniences to Iraq. have been trying to control the flow of electricity from huge power plants in the south, north and west by calling local officials there and ordering them to physically flip switches. It has been 1,575 days since President Bush announced the end of major combat operations under a banner that read “Mission Accomplished.,” and Iraq’s government cannot deliver electricity to the country’s capital. The proponents of the war and the surge like to style themselves as hard-headed realists, but what can they offer in terms of realistic expectations that the presence of an additional U.S. troops will improve conditions on the ground? Coming home from the an event like Fest involves conflicting emotions. No matter how much fun I'm having, I can't wait to return to indoor plumbing and a comfortable bed. Returning to work, I find my attention forced from musical styles, rhythms and melodies to spreadsheets, policies and procedures. But I can still rest my mind on those unexpected, luminous moments of musical or visual experience. Moments before I captured this image of the parasols in Dulcimer Grove, I watched a woman dance to a Doc Watson song in a glow in the dark hula hoop. I'm not making this up. I couldn't make this up. The best I can do is to marvel at the unexpected grace of the moment. The Philadelphia Folk Festival doesn't happen by accident; it happens because many hundreds of volunteers work to make these experiences possible. These volunteers cook the meals, patrol the grounds, pick up the trash, set up the stages, and govern this small city for this one week each year, just for the hope that they and others may find that graceful moment that in some small way makes life worth living. 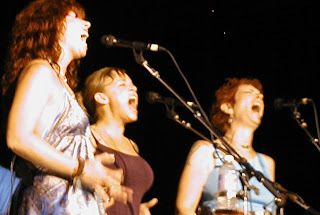 If you think you'd like to be a part of the Folk Fest tradition, mark the dates August 15 to 17, 2008 on your calender, and go to the Philadelphia Folk Song Society website for alerts on how you can volunteer. Tell 'em TommyWonk sent you. At the Philly Folk Fest, the stage lights were lit on Thursday night, when Wilmington's own Angel Band with David Bromberg presented a two hour show at the Camp Stage. Nancy Josephson, who is married to Bromberg, has assembled the most compelling version of the vocal trio yet with Jen Schonwald and Kathleen Weber joining last year. All three are capable of taking a turn as lead, especially Josephson, who is singing with power and presence I hadn't seen before. Folk fans may have heard their previous versions of the old song "Angel of the Morning," but this time out they burned the song to the ground and left its embers smoldering in my chest. I've long been a fan of Jonathon Edwards. His high clear voice has taken on added warmth over the years without losing its clarity, and his harmonica playing is a sharp as ever. Doc Watson's singing and playing is as straightforward and familiar as the footpath to your neighbor's house, and as warm as the kitchen fire that awaits you when you get there. 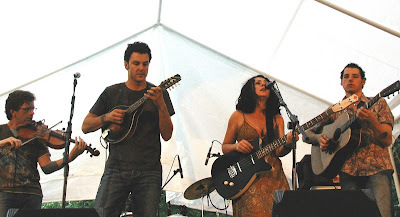 Jess Klein is a singer and player of considerable power, who conveys the range of human emotions with her shifting dynamics and expressive voice. She firmly embedded her enigmatic song "Soda Water" in the center of my brain on Friday night. It doesn't seem to be leaving anytime soon. Son Volt lead singer Jay Farrar's voice sounds as comfortable and lived in as the band's plaid shirts. The band stretched out on a couple of songs with jams in which their instruments exuded a warm, tube amp contentment. Bettye LaVette rocked the crowd with a smoking version of Lucinda Williams' "Joy." LaVette evidently found her joy, with enough left over for everyone on hand. And at the end of each evening, the parasols illuminated the way from the main stage to the campsite, where thousands picked up their instruments and lifted their voices in song. I'm back from the Philly Folk Fest, trying to recover from several days of sleep deprivation. I'll have more to report soon, but for now, I'll offer this photo of a graceful array of parasols in Dulcimer Grove. When illuminated, the parasols float like an apparition in the breeze. I'm off to the Philly Folk Fest, which again is offering a wide array of great music. I will finally get to see Doc Watson play, an experience my friend Scott Birney once likened to gazing into the face of God. Jonathon Edwards, whose voice hasn't lost any of its clarity, will be there. The exquisite Greencards, shown here in Arden last month, will be there. Wilmington's own David Bromberg and Angel Band will play the special Thursday night concert at the Camp Stage. Other performers include Jess Klein and Son Volt. As is often the case, my favorite music will likely come from an act I've never heard before. Maybe this year it will be Baka Beyond, described as an African Celtic crossover band. And when the stages go dark, the music starts up on the hill, where thousands of musicians will pick up their instruments and jam all night. I'm trying to get out of town, but I couldn't leave before commenting on some recent developments in the fight to improve Delaware's air. "A settlement of a lawsuit is conducted by private negotiations. That's standard across the world, as far as I'm concerned. It's not a public process," said John Hughes, secretary of the Department of Natural Resources and Environmental Control. But Mark Martell, president of Delaware Audubon, a conservation group, said the agreement sets a precedent that industry doesn't have to comply with state regulations. He said the state's citizens deserve a chance to look at the deal before it is executed. "This deal starts other deals," Martell said, noting that Conectiv, which has a plant in Edgemoor, is also challenging the new regulations. Of NRG's older units, he said, "That plant should have been shut down years ago. If that's what they need to do to comply, sorry about that, but they knew this was coming." Conectiv argues that the Department should have simply participated in EPA’s Clean Air Interstate Rule instead of promulgating Regulation 1146. The Clean Air Interstate Rule (also called “CAIR”) is another emissions trading rule, where a source can purchase emissions credits from other sources, including out-of-state sources, to allow it to continue to emit at its current levels without installing pollution controls.21 DNREC does not believe, mainly because of this trading aspect, that CAIR alone is sufficiently protective of Delaware citizens, who should not suffer the health effects of continued emissions levels of SO2 and NOx and continued nonattainment with the NAAQS. In fact, EPA’s CAIR modeling showed that should Delaware not promulgate Regulation 1146 and only participate in the CAIR program, pollution emissions inside the State may actually increase. In effect, it's an argument that Delaware shouldn't impose standards any stricter than the lowest standards found anywhere in the Midwestern United States. And just as Conectiv and NRG don't want to be forced to be cleaner than the dirtiest plants within a thousand miles of Delaware, if one of the companies can cut a deal, the other will want to do the same. In reality, Conectiv has demonstrated that it will do little without a regulatory driver and will litigate against any regulatory driver that does come out. However, once forced to make reductions, Conectiv then touts itself as a good environmental steward. Conectiv and NRG are fighting every attempt to clean Delaware's air, whether it be Regulation 1146 or the decision to bring wind power to Delaware. Regulation 1146 and the legal filings it has prompted can be found here. We may not be allowed to know the full story of the agreement with NRG or any possible agreement with Conectiv, but we can understand how DNREC's actions will affect our air quality. The handshake agreement between NRG and the Department of Natural Resources and Environmental Control would allow NRG to miss deadlines for limiting emissions of nitrogen oxide and sulfur dioxide by 2009. But it would require NRG to surpass state requirements before 2012, when more stringent rules go into effect. The agreement also states NRG will meet caps on mercury emissions by 2009, and improve on more stringent rules by 2012, one year ahead of schedule. Lt. Gov. John C. Carney Jr. said the agreement "sounds like a very positive thing to me" because the company will spend time limiting emissions instead of fighting in court. But Citizens for Clean Power said in a statement its members were concerned NRG was getting "a pass" to cut pollutants that cause respiratory conditions like asthma and possibly lung cancer. "We request that DNREC explain to the public why NRG is incapable of meeting the regulations as written," the group wrote. For my part, I can't help but wondering whether NRG set aside plans to put new controls in place while it pushed its proposed coal gasification plant as the way to meet new standards. This is pure speculation on my part; I'd be happy to learn more and be proven wrong. The session included presentations on the statistics of the cancer cluster. Identifying the cause or causes of a cancer cluster is difficult. It's hard to establish a clear causal connection between a source of pollution and the onset of cancer in a population. It's much easier for instance to establish a causal connection between inhaling cigarette smoke and lung cancer, which is why it is possible to state with a high degree of certainty that most lung cancer is caused by tobacco use. Which is why the committee decided that the next step in studying the cancer cluster is to try to isolate tobacco use as the possible primary cause of the elevated incidence of lung cancer. Ali Mirzakhalili, who manages DNREC's Air Quality Management Section, offered an interesting presentation on the atmospheric pathways of the small particles referred to as PM2.5 (particulate matter with a diameter of 2.5 micrometers or less). PM2.5 has been identified as a significant cause of asthma, bronchitis and other chronic respiratory ailments. Using air sampling data and detailed wind patterns from the National Oceanographic & Atmospheric Administration (NOAA), he made a plausible case that the majority of PM2.5 particles in Delaware's air come from neighboring states and as far away as the Ohio Valley. Mirzakhalili described Delaware as sitting in the middle of a "transport crossroads" where pollutants from hundreds of miles away converge. I was pleased to finally meet some downstate environmental activists, Kim Furtado and Kit Zak (having met Bill Zak last week). These dedicated and knowledgeable activists have played a significant role in turning Delaware in the direction of wind power and away from burning more coal in Delaware. 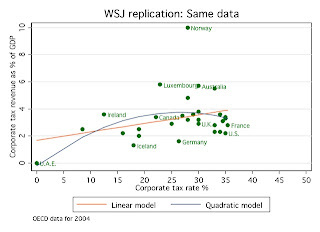 OK, the WSJ graph was incompetent, but isn't the "quadratic regression" line laffer-like? Doesn't it show the US on the wrong side of the maximum? Now, ignoring the lines altogether, the data points show the US with comparatively high corporate tax rates and comparatively low tax collections relative to GDP. It appears the US should cut its corporate tax rate! So Norway is an outlier in part because of its energy production? Maybe that's why Iceland looks so good in this data too. It appears the US should start drilling ANWR and offshore where oil production is now banned. Isn't it true that corporate tax collections went up dramatically after the recent tax rate cut in the US? First, exploiting the oil reserves in ANWR would not bring the U.S. close to matching Norway's oil production when compared to relative GDP. The curve is not pronounced, and becomes even flatter as outliers like Norway and the U.A.E. are removed from the data. It is true that U.S. corporate tax revenues have increased over the last three years. However, U.S. corporate tax rates were last cut in 1994. By the way, the data in the graph are from 2004, before the recent increase in corporate tax revenue. The recent increase in U.S. corporate tax revenues would not dramatically shift the data point on the chart for the U.S. on the chart. But the fact that corporate tax revenues have sharply increased in the last three years, a decade after the last cut in the corporate tax rate, should at the least demonstrate that tax revenues are driven by factors other than the tax rate itself. That is, unless you want to argue that the Laffer curve includes a time delay effect on the order of ten years. As I have noted, one way to get my attention is to post something inane about a subject that requires some modest measure of critical thought, which is just what Paul Smith, Jr. did with this post on recycling myths. It turns out that Paul's post simply repeated, without comment, something he read at Instapundit, which was picked up from an organization called the Property and Environment Research Center, or PERC, located in Bozeman, Montana. Starting with the first one, Professor Benjamin and the good people of PERC seem to think that we need to be protected from the environmentalists' dire warnings that "our garbage will bury us," as though recycling advocates are telling people that the Cherry Island landfill, for instance, is about to burst its boundaries and rise to cover Wilmington in trash. Presumably the wide open spaces of Montana are safer from the scourge of trash accumulation, and we needn't worry about Glacier National Park being buried anytime soon. It's a time honored and transparent tactic; make your opponents' argument sound as ridiculous as possible so that you can come across as reasonable and rational. Of course the trash from Cherry Island is not about to well up and bury the streets of Wilmington. But that doesn't mean that we don't have a landfill capacity problem; we do, and it's an expensive one. The Delaware Solid Waste Authority (DSWA) is spending $86 million on improvements to raise the maximum level of Cherry Island landfill by all of 23 feet, a cost that makes the DSWA's estimated cost of a new landfill, $106 million, look rather low. At the heart of PERC's pronouncements on these so-called recycling myths is the belief that markets capture all relevant costs and can solve all our environmental problems. According to PERC, if recycling made sense, it would already be economically advantageous. The problem with this argument is that the economics of landfilling reflect current costs, not future costs. It may be that the land for a new landfill will be more easily bought in Montana than in Delaware. Even so, analysis I published last year demonstrated that a modest investment in a single stream recycling facility would more than pay for itself by postponing the large cost of siting and building a new landfill to serve New Castle County. Curbside recycling, for example, requires that more trucks be used to collect the same amount of waste materials. Kent County will scrap one of its weekly trash pickups but offer every-other-week curbside recycling across its 117 refuse collection districts in January, according to the county and the Delaware Solid Waste Authority. Perhaps we should allow Professor Benjamin the benefit of the doubt on this score. Of the eight sources listed, seven are more than ten years old. In the 1990s, the debate on the efficiency of recycling revolved around commodity prices, not on the methods used to collect and process materials, which have advanced since then. Mark Twain famously said that "A lie can travel around the world while the truth is putting on its shoes." We see how this list of recycling "myths" travelled from Montana to Delaware and who knows where else via a conservative blogger. It may have taken me a couple of weeks to put on my shoes, but I could not let this collection of outdated nonsense go unchallenged. they had we never would have seen the squalor in the Superdome, the desperation on the rooftops, the shocking tableau of the Mardi Gras city underwater for weeks. We never would have heard the comment "Heckuva job, Brownie." The Federal Emergency Management Agency (fema) was the scapegoat, but the real culprit was the U.S. Army Corps of Engineers, which bungled the levees that formed the city's man-made defenses and ravaged the wetlands that once formed its natural defenses. Americans were outraged by the government's response, but they still haven't come to grips with the government's responsibility for the catastrophe. They should. Two years after Katrina, the effort to protect coastal Louisiana from storms and restore its vanishing wetlands has become one of the biggest government extravaganzas since the moon mission—and the Army Corps is running the show, with more money and power than ever. Many of the same coastal scientists and engineers who sounded alarms about the vulnerability of New Orleans long before Katrina are warning that the Army Corps is poised to repeat its mistakes—and extend them along the entire Louisiana coast. If you liked Katrina, they say, you'll love what's coming next. "They didn't need hurricane levees," says Kerry St. Pe, a marine biologist whose ancestors arrived in 1760. "They had wetlands to protect them." New Orleans wasn't on the coast, and hurricanes wilt over land. Now the Gulf has advanced some 20 miles (32 km) inland, thanks in large part to the Army Corps. The Corps started as a Revolutionary War regiment, fortifying Bunker Hill, but it evolved into an all-purpose engineering unit, eventually overseeing local flood control on the Mississippi. The Corps ordered communities to imprison the river in a narrow channel with a strict "levees only" policy, rejecting calls to give the river room to spread out. So levees rose, and the Corps repeatedly declared the river floodproof. But the constrained river also rose, and its jailbreaks repeatedly proved the Corps wrong. The result is that New Orleans is sinking, and about 30% of the coast's wetlands have slipped into the Gulf, jutting Louisiana's chin even further into the path of Mother Nature's fist, endangering the U.S.'s largest offshore oil and gas fields, a lucrative seafood industry, a busy network of ports and about 2 million people. The entire piece is saddening and maddening. I'm tired of writing nutritionally balanced posts which taste like bran and untreated tofu; where the particles dangle like iron pills mixed into the food in the dog's bowl. I want to write deliriously delicious posts, silver spoonfuls of angel-food cake but with wicked drops of dark chocolate hidden in the fluffy cloud. I want to write a post which makes you fat and happy and post-orgasmically satiated. Alas, it's not to be, right now. This set me to thinking: Is TommyWonk the blogging equivalent of broccoli? Do my recurring admonishments to do your (policy) homework come across as nagging my long suffering readers to eat your vegetables? If you tire of the healthy sips of green tea you find here, you could head over to the bottomless cup of coffee that is the Mike Protack saga at First State Politics. Allan Loudell has invited me back on WDEL, 1150 AM around 12:35 for another update on wind power. As I reported last night, the parties in the energy negotiations have agreed on September 14 as a deadline for coming to terms. (1) The PSC will hear a report from mediator Lawrence Hamermesh on the negotiations. This will be the real news. (2) The PSC will act on draft Order 7247 which, as written, would deny Jeremy Firestone's motion to require more detailed reports on the negotiations. Even though I have thought that this motion makes sense, I am not greatly concerned about the PSC's decision on this. Given that the PSC has directed Delmarva Power to negotiate an agreement to bring wind power to Delaware, I am inclined to give the Commission the benefit of the doubt as to how its mandate is carried out. [PSC] Staff asserted that both NRG and CESI had the opportunity to submit a wind proposal in December 2006 pursuant to the terms of the RFP but did not do so. Staff characterized CESI’s recent interest in submitting a wind proposal as a desperate last-minute attempt to stall the current negotiations. Staff warned that delaying the negotiations could hinder Delaware’s attempt to diversify its energy supply, prevent an informed decision on the generation bids, and waste millions of dollars already spent in the process. The sharp language found in the draft Order underscores the degree to which the state agencies have lost patience with the machinations of Delmarva Power, Conectiv Energy and their parent company, Pepco Holdings. I will have more to report tomorrow. Imposing the Laffer curve on the data isn't as delusional as pointing to an apparition of the Blessed Virgin in a grilled cheese sandwich, but it is intellectually dishonest. 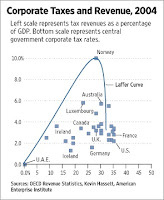 But as numerous bloggers pointed out at the time, the alleged "Laffer curve" drawn in the graph is absurd. It's fitted directly through the data point for Norway, an obvious outlier with significant oil revenue (and an omitted excise tax), and then plunges straight down toward zero (who knew that increasing your corporate tax rate from 28% to 32% was so destructive?). Nyhan reconstructed the data presented in the offending graph and ran linear and quadratic regressions on the data. The results weren't even close to the WSJ fantasy. So is this a case of intellectual dishonesty or just editorial hyperbole? An educated reader who looks at such a graph has a right to assume that the curve is actually related to the data presented. This was clearly not the case with the WSJ graph. Reasonable people can disagree about macroeconomics and tax policy. But you can't claim that data support a particular position, without doing the math. The WSJ didn't do its homework and instead presented a curve that was clearly not based on the data, and thus intellectually dishonest. As I recover from my unscheduled encounter with the pavement, I want to turn the focus from my experience on my bicycle to the larger questions of road design and transportation policy. In doing so, I will offer the blindingly obvious, and hardly original, observation that roads are not intended for those in cars only. Everyone who gets in a car eventually arrives at a destination. And whether the destination is on a city street, along a country road, in a suburban development, in an underground garage or in the parking lot of a shopping center, provision must be made for ensuring the safe interaction of people in cars and people on foot. This insight found its way into the Intermodal Surface Transportation Efficiency Act (ISTEA) in the early 1990s. ISTEA shifted the focus of federal transportation dollars to meeting the needs of people on foot as well as those in motor vehicles, who after all are the same people. This shift in thinking led to the inclusion of pedestrian friendly features in road design such as median strips and curb bump-outs that serve the dual purposes of slowing or calming traffic and making it easier and safer to cross the street. Next up: I offer my unified theory of speed bumps, which describes why suburban neighborhoods are so hazardous for the children who live there. I got back on my bike this evening, for the first time since I was suddenly placed in sudden and close contact with the pavement last Saturday on Kennett Pike (Route 52) where it meets Route 141. Kennett Pike is a nice wide road. It feature four lanes through Greenville, and has consistently wide shoulders from Wilmington out to the state line and on up to Route 1. I ride my bicycle on Kennett Pike from Wilmington to Centerville or into Pennsylvania, where I like to turn aside onto the country roads I love so much. When I think back on the moments when I've been put in danger on my bike, I realize that the lion's share of the incidents have occured on Kennett Pike. I'm forced to the surprising conclusion that narrow country roads, if they're not too heavily travelled, are safer than wide roads with their comfortable shoulders. And when considering wide roads, I'm not thinking about roads like Concord Pike, which I have never ridden on my bike. I am using Kennett Pike, the only heavily trafficked road I will ride, as my baseline. In a typical ride, I will spend as much time, and as many miles, on narrow county roads as I do on the supposedly safe shoulders of Kennett Pike. And yet, in reviewing the incidents that have forced me to the pavement, or otherwise placed me in physical risk, I conclude, in my unscientific personal experience that, mile for mile, lightly travelled narrow country road are safer than Kennett Pike with its wide shoulders. Why would that be? I don't propose to elevate my personal experience to extra-scientific importance. Instead I recount these incidents to make a point that traffic speed and volume are the two most significant factors in determining the safety of anyone travelling on a bike. When I review these incidents in detail, I conclude that the speed of the motor vehicles involved, and the relative ability of the drivers to otherwise ignore the presence of a cyclist on the road, are the most important factors in determining the danger posed to someone legally riding his or her bike along the road. Next up, I will recount these incidents in my personal experience to illustrate the factors that create hazards for those not driving motor vehicles.